The Plain and Simple Series® are small, easy to read books that are designed to give hope to the reader and make the road toward a relationship with God easy and practical—plain and simple. These little books will also introduce the studies in The King’s High Way trilogy (The Way of Agape, Be ye Transformed and Faith in the Night Seasons). They are topical books that provide quick insights, as well as the basis for further study. Click on any book to go to it’s page and see more details and options. Share these pocket books with your friends, co-workers, as well as your church and family members. The Plain and Simple Series books may be small, but they are not shallow. 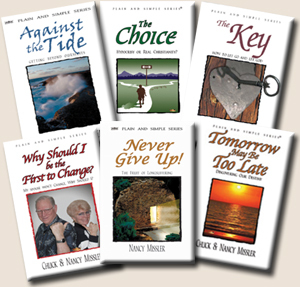 The principles found in these books can be life-changing, in either a group or individual setting. Have any of these books been published in Spanish. I’m especially interested in a Spanish version of WHY SHOULD I BE THE FIRST TO CHANGE. I’m sorry but “Why Should I Be the First to Change?” is not in Spanish at this time. We do have “The Way of Agape” and “Be Ye Transformed” available in Spanish on our website. I’ve put the link below or you can go to: http://www.kingshighway.org and go to the “Books” tab, then “Translations”–over to the right are the different translations we have available for some of our textbooks. They are free…so enjoy! !